Researchers, schoolchildren, educators, and whoever else is interested in scientific and cultural content can browse its pages to find important resources related to scientific and cultural knowledge. 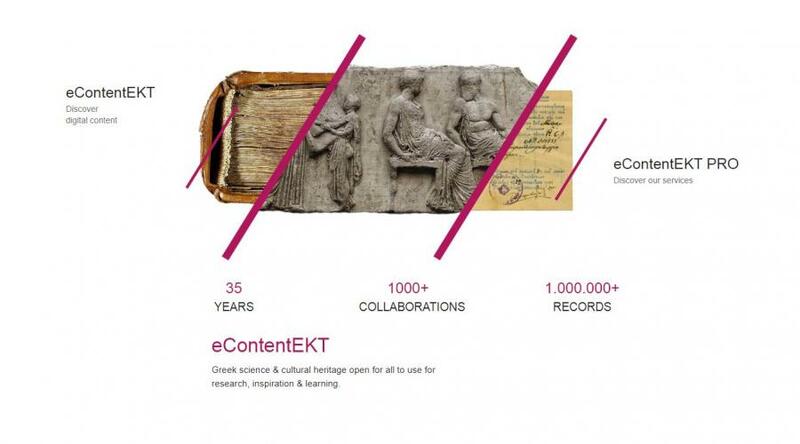 The digital scientific and cultural content collected and aggregated by the National Documentation Centre (EKT) is available at econtent.ekt.gr, which is designed as much for those who simply want to find scientific and cultural content as for organisations which want to share and promote their digital content. The online site functions as a ‘directory’ where the user can discover the variety of digital collections, library catalogues, theses and scientific publications, indexes and applications available on EKT infrastructures. Organisations that want to publish or promote their digital content can find information about EKT services and the solutions it offers for the dissemination and reuse of digital content. The website is divided into two main sections, ‘Discover Digital Content’ and ‘eContentEKTPro’, making it easier for two distinctly different user groups to navigate. The dynamic appearance of the site along with the clear layout makes navigation very easy for the user in an environment of modern aesthetics and functionality. ‘Discover Digital Content’ provides open access to a wide range of content from a central point. Content includes: digital collections, library catalogues, PhD theses, ebooks, conference proceedings and scientific journals, indexes, research tools, interactive applications, and educational content. Researchers, schoolchildren, educators, and whoever else is interested in scientific and cultural content can browse econtent.ekt.gr to find valuable resources. At the end of 2018, approximately 483,000 Greek cultural assets were available at SearchCulture.gr, the national aggregator for cultural content, and 723,000 records were available at OpenArchives.gr, EKT’s scientific content aggregator. At didaktorika.gr, one can search amongst the 40,000 PhD theses, and 35 scientific journals, 8 monographs and more than 1,000 conference papers can be found at ePublishingEKT. EKT has 25 digital repositories with educational, cultural, scientific and audiovisual content covering a range of subjects, while the library catalogues hosted by openABEKT now exceed 100, including, amongst others, the Hellenic Parliament Library, the Acropolis Restoration Service Library Catalogue and catalogues of archaeological and religious institutions. In addition, the site’s ‘Research Aids’ page includes the Humanities and Social Sciences Index and the National Union Catalogue of Science Journals as well as useful bibliographic databases. ‘eContentEKTPro’ mainly targets scientific and cultural content organisations and gives details about all the services EKT offers for documenting digital content, with a view to disseminating knowledge. To meet their particular needs, organisations can search the following sub-sections: Contribute your data, Digital content solutions, Data Services, For libraries, For publishers, Our services A-Z, Our collaboration. Over the last few years, EKT has collaborated with and supported more than 300 organisations, providing infrastructure and services for the management and dissemination of their scientific and cultural content.